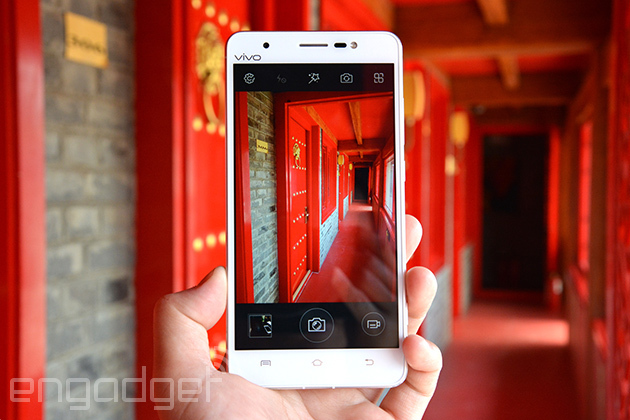 Despite its relatively small presence outside China, Vivo is still a mobile brand that's worth keeping an eye on. The company's known for its fondness for high-end audio chips, and it's also often one of the very first to pack the absolute latest components into a phone, as demonstrated by its Xplay plus Xplay 3S. 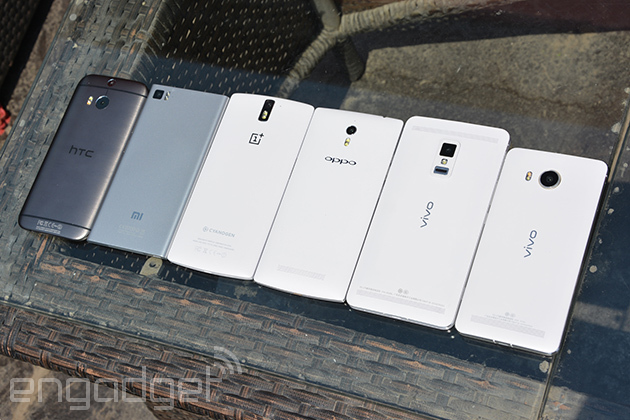 At one point, Vivo even boasted the world's thinnest phone until local rival Gionee broke the record. This time, the ambitious brand has launched a camera-centric smartphone dubbed the Xshot, which is the first to pack a camera with both a fast f/1.8 lens speed and optical image stabilization. Naturally, we had to get our hands dirty with it. Let's start off with the basic specs. The Xshot comes in two flavors: the "flagship" version packs Qualcomm's awesome Snapdragon 801 SoC (quad-core, 2.5GHz) with 3GB of RAM and 32GB of built-in storage, whereas the "elite" version has the 2.3GHz Snapdragon 800 with 2GB of RAM and 16GB of storage. Both come with microSD expansion (up to 128GB) and Micro SIM support, and these are brought together onto a single pin-eject tray. You also get a relatively more palm-friendly 5.2-inch 1080p LCD, as well as a non-removable 2,600mAh battery within the shiny aluminum frame and smooth plastic cover -- very much the same solid construction as the Xplay 3S. Unsurprisingly, there's LTE radio here, but only the flagship version supports both FDD-LTE and TD-LTE. The Xshot's main camera features the rather common 13-megapixel resolution, but its combination of optical image stabilization plus a bright f/1.8 aperture makes it a rather unique selling point. The downside here, as you can see in the earlier photo, is that the bulky camera literally sticks out like a sore thumb on the back. On a more positive note, you get a two-stage shutter button on the side, which should provide a better grip and easier camera control. Vivo's also thrown in a dual-tone LED flash that's also used by the iPhone 5s and the latest HTC One for prettier flash photography. As for video, this camera's capable of 4K capture, though we remain skeptical of the video quality coming from such a tiny sensor. The front camera isn't too shabby, either: it's capable of shooting 8-megapixel stills plus 720p video, and it even has its own LED flash (Vivo did the same with last year's female-oriented Y19t). While we weren't allowed to share sample shots due to the device's pre-production nature, Vivo's confident that its collaboration with ArcSoft should guarantee decent images from the Xshot's cameras. They also support voice-activated capture, beautification and even real-time virtual make-up! Don't worry, Vivo hasn't sacrificed any audio goodness here for the sake of the camera features. The Xshot comes with a "powerful" Maxim MAX97220 headphone amplifier, along with a refined Cirrus CS4398 DAC that's apparently less than half the original package size, as well as a Texas Instrument TLV320 ADC chip for a wider audio input bandwidth. We've already praised Vivo's audio efforts in our Xplay review, so the Xshot shouldn't be disappointing on this end, either. Software-wise, the unit we played with ran on Vivo's Funtouch OS 1.2 based on Android 4.3, but the retail version should ship with Android 4.4. Much like the Xplay 3S' system, you'll find handy features including screen-off gestures, "air wake" gestures and a timeline desktop that lists out your app plus camera interactions chronologically. By the way, if Chinese isn't your forte, you'll have to put up with some "Chinglish" dotted around Vivo's software. The sad news is Vivo has yet to officially launch the Xshot outside China, but you should be able to grab one from the usual e-tailers (or just ask your Chinese pen pal). Just for your reference, both the flagship model and the elite model are due end of May in China, with the former costing CN¥3,498 (about $560) and the latter CN¥2,998 (about $480).